Got up and took Mix for a walk before having a lovely hot shower and setting off (with Mix) for Gavinton Church where I helped Rachel set out the Christingles and marvelled at the work of decorating the Church for Christmas. On the way home I helped Ann buy a Christmas tree and loaded her car with logs from Pearsons – one of staff at Pearsons told me that she had often thought that I would make a fine Father Christmas: it is much nicer than being mistaken for someone unpleasant! 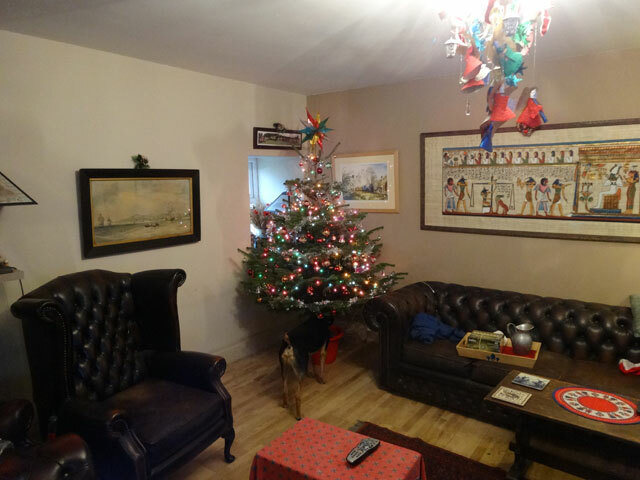 Back home, Rachel erected the Christmas tree while I ensured that everything was ready for the service tomorrow. Then I sat down to prepare some music for Bill had who arranged for me to be sent several pages of musical script. It took quite a while but I was happy with it once it was done. We all dined in the farmhouse and afterwards Rachel and I watched an episode of Montalbano before bed. It has been a good day.